I have officially popped. More than a few weeks ago I was greeted by a close friend with something like “omigad! You’re huge!” Yes… when its time to have you’re third, its time to really show… and really show early. So this time around, I’m not using a lot of the old clothing yet… I can’t. They’re all spring and summer weight and style. And while I’m hoping bright, colorful pants will still be the rage the spring (as that’s what I have from the past) I have had to invest in a few new items. As soon as we heard the 10-week heartbeat, I headed to the mall for my ‘congratulatory’ gift. And while the huz wasn’t too pleased with the price, I found Joe’s Jeans from A Pea in the Pod’s Designer Jeans Collection to be the most comfortable and the most complimentary. Of course, like all fine jeans, you can’t just guess and order. You do need to try these jeans on. I tried on several pair, all had different looks, fits and compliments. And just like we advise you to head to your local jeans store (ala Nordstrom) to try and try until you find the best pair, if you really want to look good, go somewhere like Pea in the Pod to find the right fit of jeans. On top, I found the cutest half-sleeve tee at Tees for Two. Apropos for me, my shirt has a graphic of a baby with shopping bags and is labeled “shopping for two.” LOVE it. With the weather as wacky as its been, I’ve been able to wear it once or twice alone and it cracks me up. The shirt is fitting nicely over my belly and looks so cute with jeans. Its a comfortable fit, not too tight anywhere. 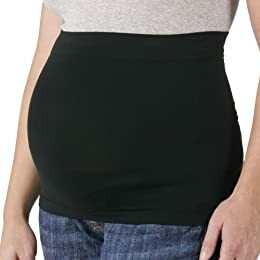 For days when my shirts are a little small, I’ve hid my belly with a Be Band Maternity Band, available at Target. In black, its totally inconspicuous, keeps my tummy warm and holds in the bulge. I can see using this after the birth as well. Keeping me warm, I have to remind you of a sweater I reviewed last year by Inca Textiles. I find myself wanting to wear my Zina sweater daily. I love the way it fits and the quality of this Peruvian Alpaca sweater. Inca Textiles is currently having a spring online sale: 20-75% off their gorgeous collection. If you or someone you know is expecting, you MUST check this out! I am 20-1/2 weeks along with my third and finally broke out some maternity clothes last week. I THOUGHT I needed to switch to maternity pants, but turned out I just needed to wear my regular jeans around for an extra day after washing before they got comfortable again. I may have another week at best, but I’m milking it — I love my regular jeans. As for shirts, though, I got sick of tugging things down over the belly, so I’m in a maternity/nursing tank and a maternity sweater. I’m in a similar boat – can’t wait for spring to break out some of my lighter and brighter maternity dresses and the like. In the meantime, thanks for these leads. I think I might just have to buy my own congratulatory prize!